I thought I would write something around ANZAC Day but found a number of themes started to crystalize in my mind, so I have decided to separate them into different posts. Today I would like to focus on a positive aspect that came out of the great wars. Although New Zealand is populated by relatively recent migrants (in historical terms even Maori are recent inhabitants), travel was expensive and for many the voyage to New Zealand was their last major journey and later generations only dreamed of returning to their family and cultural origins. With both world wars the opportunity to travel and see new places was a big part of why many young men, and a few women, signed up. Despite the horrors of battle and the tragic consequences that results from mass conflict the wars also brought the nations of the world closer together in a way that mere travel could never do. Strong alliances were formed between allied countries, many soldiers were welcomed into the homes of the countries they fought in and many new families were established through relationships formed abroad. 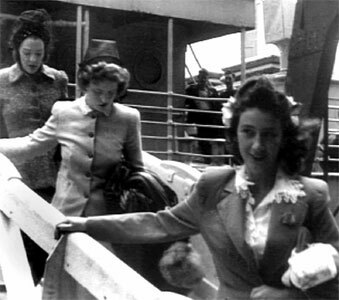 A ship was commissioned after WW 2 to transport around 600 English brides so that they could join their New Zealand husbands and many local women left our shores to join their US serviceman husbands. War has even brought past enemies closer together with thousands of young New Zealanders and Australians returning to Gallipoli to see for themselves the battlefields that were instrumental in shaping our respective country's identity. The Turks were admired as adversaries and have been appreciated as welcoming hosts in the following years. My own relationship with my English born wife, Vicky, has a direct connection with WW2. Vicky's mother and uncles were sent to New Zealand through Britain's flawed attempt to protect its children by sending them out to safer parts of the British Commonwealth. Although many children suffered through being separated from their parents and many were badly mistreated by their host families, Vicky's mother had a very positive experience (even becoming Dux of Wellington East Girls College). Although Vicky's mother and her brothers returned to England after the war their connection with New Zealand was a strong one and consequently when Vicky was contemplating working overseas a job advertised by Southland Hospital looked very attractive. I am also writing this with some degree of sadness because Vicky's uncle, David Salkeld, has only just passed away. David's love of New Zealand never ended and he and his wife made countless trips back here to visit old school friends and members of his extended family. He was a remarkable man in many ways, he had a high rank in the RAF and was badly injured by an IRA bomb, which caused severe deafness and some disfigurement. His injuries never stopped his interest in travel and his keen intellect was always evident as he pondered various world mysteries and loved to share his latest theories on their possible origins. A stroke a few years ago was largely overcome with amazing determination as he regained his speech and letter writing skills. David's personal enthusiasm and genuine interest in friends and family connected many people across the world and demonstrated how courage and determination can overcome the violence that can occur within it. I feel honoured to have known him and he will be greatly missed.